Natural wool (except clothes). The hat, mask, sole and the heels of shoes are also made from the wool. 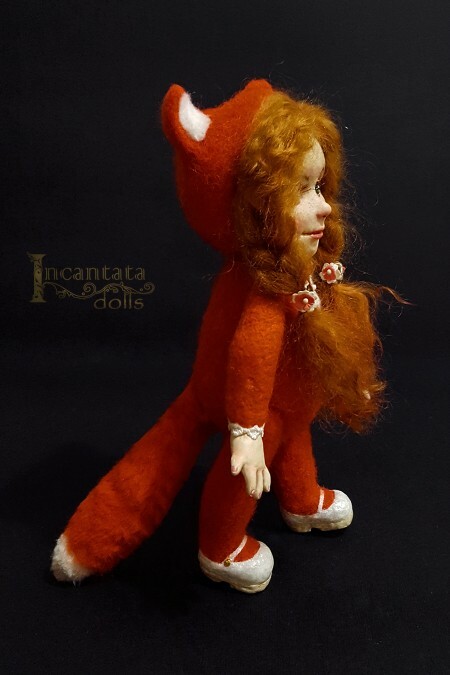 Poseable doll, without a armature, without plastic, only wool. Patented wool processing technology with the felt hardener. Therefore, the surface of the face, hands, legs and partially the body is absolutely smooth. Painting with pigments (not washed off). 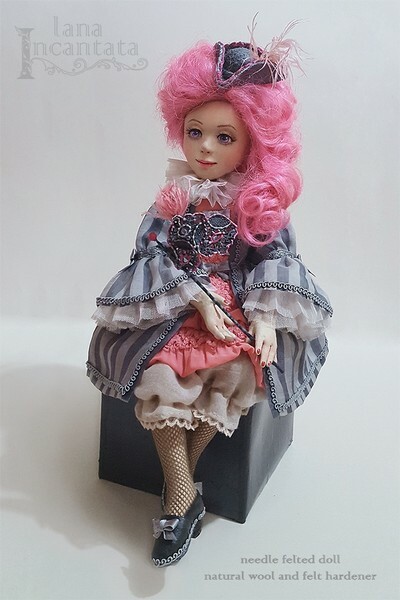 The doll is not afraid of moisture, sun light, low temperatures and the moths. 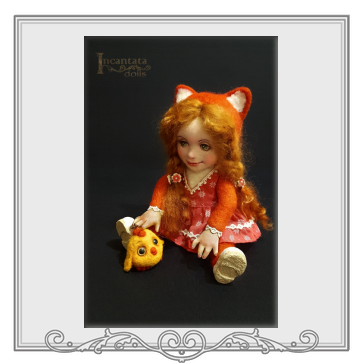 height 17,5 inch (44 cm), weight 300 grams (0,7 lb) (with clothes and shoes). Teddydoll. 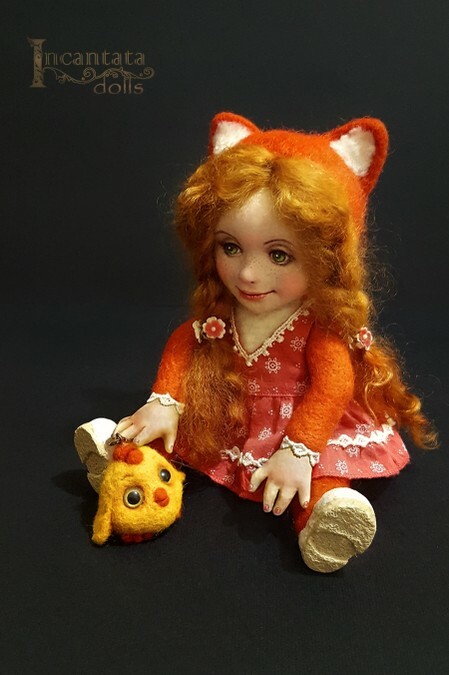 Foxy and her chick. 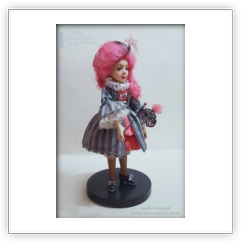 Original art doll. 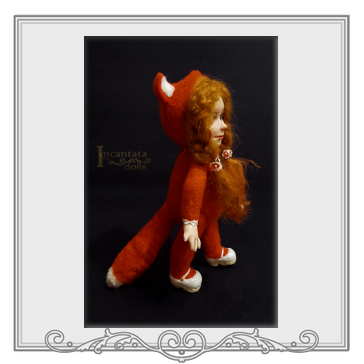 Felted teddydoll. Single instance. All the details (except sewn by us dress and leash for chick) are natural wool. 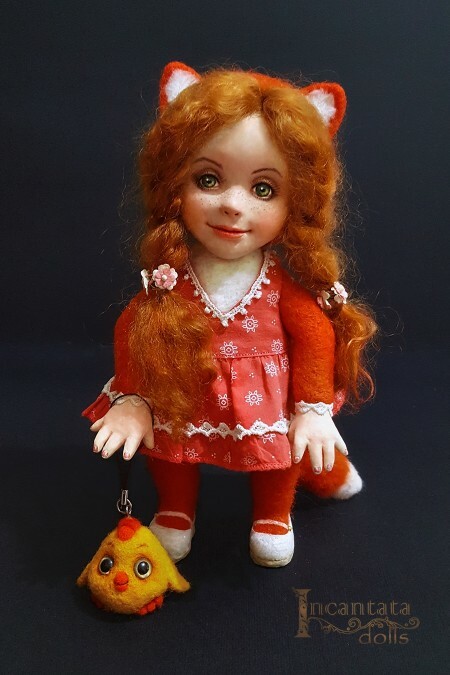 The doll is created in the technique of needle felting, without wire and without plastic. The face, hands, shoes are also felted wool (not plastic! ), with special treatment with felt hardener (fully ecological), painted with acrylic paint. The technology is registered and licensed . Smooth parts of the doll do not suffer from falling (as actually not smooth parts :)). 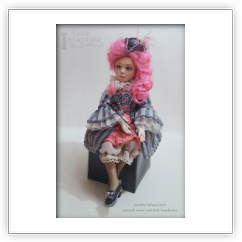 The doll is mobile: stands, sits; can move hands, legs, head, tail. 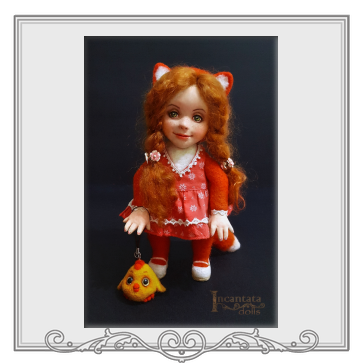 Hight with ears 24 cm (9,5 inches), weight 160 grams. This image and design may not be reproduced, copied, edited, published, transmitted or uploaded in any way without my written permission. completely from textile: felting base from sintepon and cotton (personal copyrighted method) and tricot cotton. 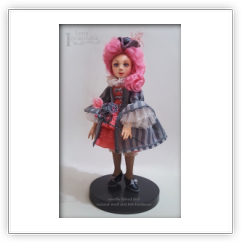 Sits steadily, stands on a doll stand; arms, legs, neck - movable. Particular ecological covering (nanotechnology) - water- and greaseproof, UFfilter. No armature, no plastic, no metall, just textile. Thanks to a special technique, perfectly keeps the shape without the armature. 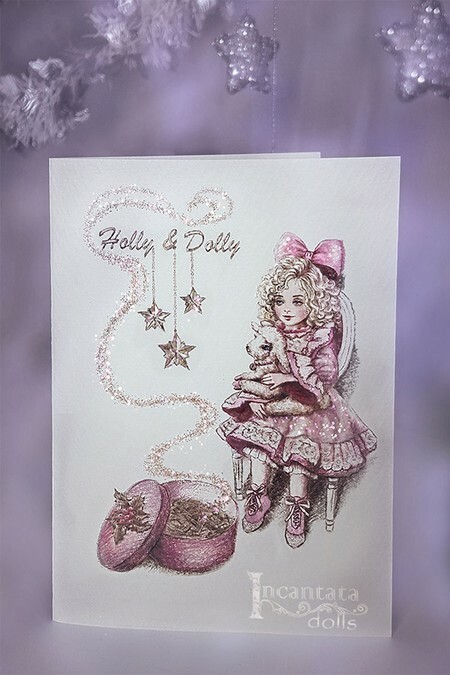 Painted with DecoArt SoSoft Fabric Paint. Wet and steam cleaning. 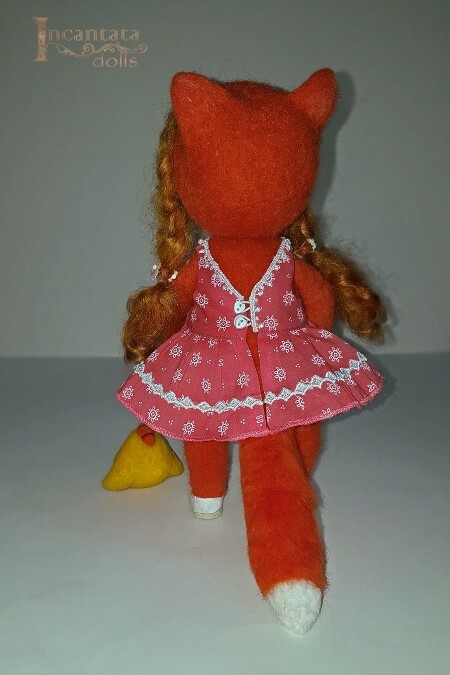 All clothes and shoes are removable, handmaded. 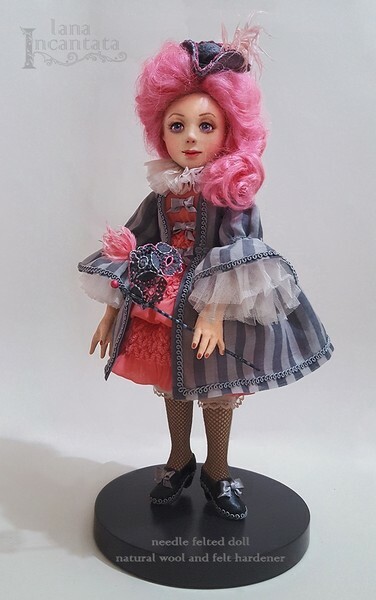 Dolly (lamb) created by me from faux fur. The eyes (of the doll and the lamb) painted with Fabric Paint. 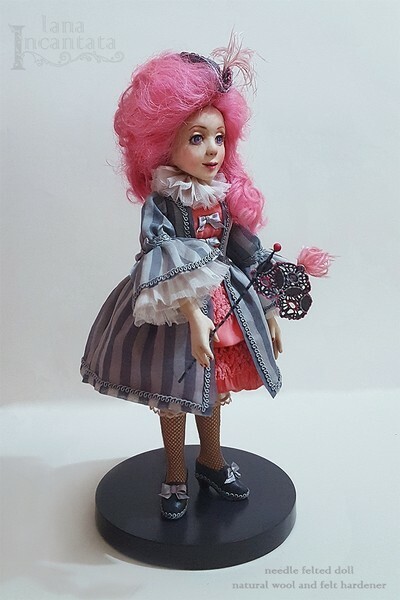 original art doll - unique instance, created for private collection.